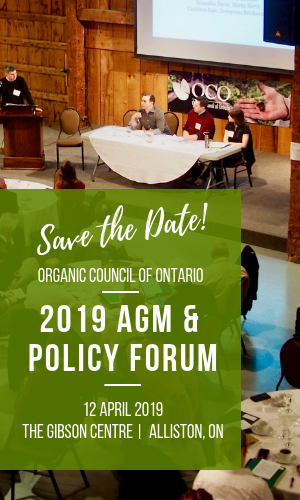 At their Annual General Meeting in Guelph on March 24, members appointed twelve people to the Board of Directors for the Organic Council of Ontario (OCO). Representing the entire value chain, the twelve members of the board are Tom Manley (Processor and current Chair), Ralf Thorsten Arnold (Distributor), Bill Redelmeier (Producer), Joel Aitken (Certifier), Mary Wales (At-Large), Jonathan Eric Ferguson (Marketer), Lauren Stallard (At-Large), Michael Budd (Retail), Rob Wallbridge (At-Large), Simon Jacques (At-Large), Sarah Bakker (Non-Profit/Association), and John F. Devlin (At-Large). 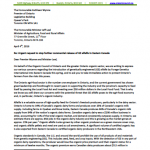 “We need to build Ontario’s organic production and processing capacity by facilitating farmers’ capacity to transition to organic and by getting provincial organic regulations in place,” said Wallbridge. Currently, organics in Ontario is over $1 billion in sales, approximately 25% of the Canadian organic market, and is growing at 10-20% annually, but the reality is that there is not enough organic production to fill the demand in this province. “With strong sector development supports, there will be greater access to Ontario organic agricultural products across the value chain,” said Manley. Officers for 2016-2017 will be appointed at the next Board of Directors meeting at the end of April. Tom Manley is the owner of Homestead Organics in eastern Ontario – Canada’s leading organic grain processor and farm supply business – and is a recipient of OCO’s Lifetime Achievement Award in 2011. Tom was the lead organizer for Eco Farm Day, an annual organic farm conference in Cornwall for about 14 years, and is Chair of the community advisory council of Alfred College. John Devlin is an Associate Professor in the Rural Planning and Development Program at the University of Guelph where he teaches planning theory, development administration and project design. His primary areas of academic interest include: agricultural policy, environmental policy, and public participation in environmental assessment. He is co-chair of the Public Participation Section of the International Association for Impact Assessment. A long-time promoter of organic agriculture he has co-edited one book, Ecological Agriculture in Eastern and Southern Africa, and numerous articles and conference presentations on environment and development issues. He is particularly interested in mobilizing consumer advocates for the organic food system. Joel has a degree in agriculture science and a masters in Capacity development and extension from the University of Guelph and has been working in the organic sector as a researcher, inspector, certification officer and consultant for the last 7 years. Bill has been a proud farmer all his life. Southbrook has been certified organic since 2008 and we have been leading the push towards quality organic and biodynamic wine since that time. Our particular aim has been to grow the organic wine sector. With his wife Kristine, Thorsten owns Persephone Market Garden since 2009. Since 2016, he has also been managing an emerging food distribution co-operative that sells local food, supplemented with organic out-of-area products. He was involved in this initiative from the start as lead consultant for a business plan. He has a PhD in Agriculture. Jonathan is the Director of Sales and marketing at OH International and brings a wealth of experience in media relations and journalism to the board. Michael has 2 years experience on the OCO board, and 20 years with business building. He represents a growing community of consumers and business owners who are keenly interested in the success of the organic brand and ideology. Sarah Bakker and her family run Field Sparrow Farms, which raises pastured poultry, pork, and grass-finished beef on 100 acres in Bobcaygeon and markets direct to consumer at farmers’ markets and wholesale through co-ops. 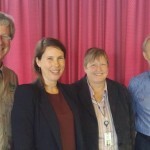 She is also the General Manager of the National Farmers Union – Ontario. She hopes that her experience will bring increased awareness of organic across sectors and commodity groups. She also brings an understanding of challenges in organic certification for the small farmer and an interest in developing policy. Previously, she sat on the boards of the Lindsay Horticultural Society and the West End Food Co-op. Lauren has worked in community engagement, customer service, sales and education for over five years. She has a passion for the environment and health and has been connected to the Organic Council for many years. She has been working for Organics Live for the past 2 years. Mary has worked for the Organic Council of Ontario in the past as well as for other agricultural organizations, mainly in communications roles. She has a strong understanding of agricultural issues, both from growing up on a farm and through her education and career. She has completed an IOIA organic crop inspection course. Simon has a particular interest in the Organic Standard as it relates to crop inputs. He participated in the recent Standard Review Process in the “Permitted Substances List; Crops” working group, with the aim of making the organic standard more sustainable. Rob has been an organic farmer since 1998, operating a mixed farm and selling certified organic vegetables to consumers, retailers, and chefs in the Ottawa area. He is an IOIA-trained organic inspector, has volunteered on the Livestock Working Group of the CGSB Technical Committee on Organic Standards since 2008, and was recently invited to sit on the Organic Value Chain Round Table. From 2002 until May 2015, he was part of the Member Relations Team of the Organic Meadow Co-operative, providing extension services to organic and transitional-organic farmers across Ontario, with a focus on Eastern Ontario. He continues to provide consulting services to a wide range of farmers and businesses in Ontario’s organic sector. He wants to help OCO become a professional, truly representative voice, and the go-to organization for information, resources, and perspectives on Ontario’s organic sector.